This is a holiday fa﻿mily favorite that I wanted to share with you. I like to serve it alongside ham on a buffet or take to a potluck gathering. ﻿1. )Preheat oven to 350 degrees. Butter a 13-by-9-inch baking dish; set aside. Bring a large pot of salted water to a boil. Add noodles; cook until al dente according to package instructions, about 6 minutes. Drain noodles; return to pot. Set aside. 2. )Put eggs and sour cream into the bowl of an electric mixer fitted with the paddle attachment; mix on medium speed until combined. Mix in 3/4 cup sugar, 3/4 cup butter, and the cream cheese. Set aside. 3. )Heat 2 tablespoons butter in a large skillet over medium heat. Stir in 2 tablespoons sugar, the cinnamon, and nutmeg. Add apples; gently toss to coat. Cook, tossing occasionally, until soft and caramelized, 10 to 12 minutes. Stir apples into egg mixture; pour over noodles. Toss gently to combine. Pour into prepared dish. 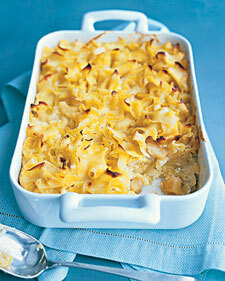 Drizzle remaining 2 tablespoons butter over noodles; sprinkle with remaining 2 tablespoons sugar. 4. )Bake until set and top is golden brown, about 30 minutes. Transfer to a wire rack; let stand 15 minutes before serving. This side dish serves 8 to 10 people. We are being pummeled with wind here and the power is blinking intermittingly. If it settles down I'll try up loading my own photos.